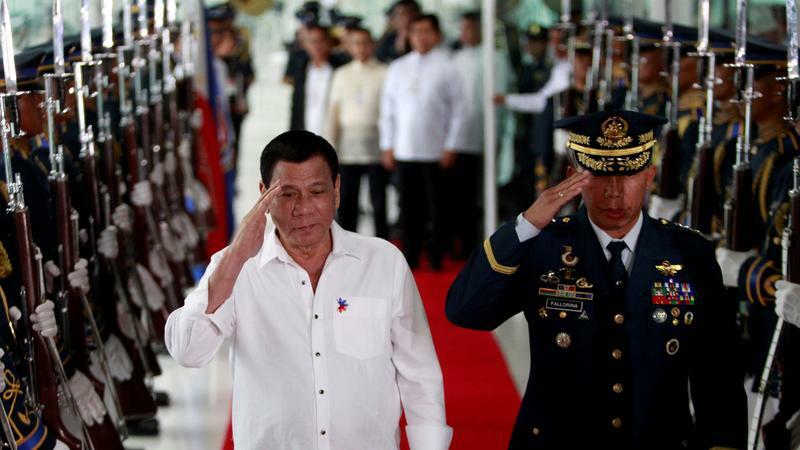 Philippine air force Lt. Gen. Edgar Fallorina (R) escorts Philippine President Rodrigo Duterte before Duterte's departure for Cambodia, at the Ninoy Aquino International airport near Paranaque, Metro Manila, Philippines, on Dec. 13, 2016. US President-elect Donald Trump is a well-known personality on Twitter — his "unpresidented" tweet is among a plethora that has caused a stir — and one day, he even blocked a high schooler who called him a "reject Cheeto" — but he's hardly the first world leader to turn to social media to address the public. It has also come to light, especially recently, that social media's global reach can be used to perpetuate fake news, "troll" dissenters, and, for some politicians — give the impression of widespread support. Like in the Philippines. President Rodrigo Duterte, who came into power last year, has already proven himself to be a "power user" on Twitter: He has allegedly deployed a sort of “social media army” to not only push out pro-Duterte propaganda but to keep his critics in check. Journalist Sean Williams says he’s been on the receiving end of Duterte’s keyboard army, something that he details in an article titled, “Rodrigo Duterte’s Army of Online Trolls,” which has been published in this month’s issue of The New Republic. Williams stumbled upon "a bit of an online tale," as he put it, back when he was reporting on the violence in the Philippines. In September 2016, he tweeted about the Filipino president’s war on drugs. His post quickly got the attention of a young woman named Madelyn. She replied to Williams — writing him off as a "troll," and a “foreigner who knows nothing bout my country,” he recounts in the magazine piece. It wasn't long before Williams noticed that Madelyn's Twitter stream was chock-full of adulation for President Duterte. And she seemed to tweet about him constantly throughout the day. Maybe because he's a reporter, Williams didn't just drop the subject and move on. He asked around to others involved in journalism and human rights in the Philippines about the back-and-forth on Twitter. Furthermore, Duterte’s social media strategy seems to be effective, and it has a lot to do with the island nation's overall youthfulness: The average age in the Philippines is 23, and nearly half of its 103 million residents use social media, according to Williams. But it also is a result of the way that mobile phone networks and the internet play out there, funneling only certain content to people. “So, for instance, a huge, huge part of all of this is that people get Facebook free with their phones but they can’t actually click through to anything ... because they would incur data charges,” Williams said. Some people are paid to promote Duterte online. Often, they create fake accounts on social media and because the government is behind it, “It’s really hard for any opposing voices to get their voices heard,” he said. More broadly, the scenario shows how Twitter, Facebook and other social media platforms, once seen as belonging to the masses, have been co-opted by these bigger players. “They’re kind of being used by the people with the most money and the bigger means to get that message across, and that’s kind of a worrying development,” said Williams.